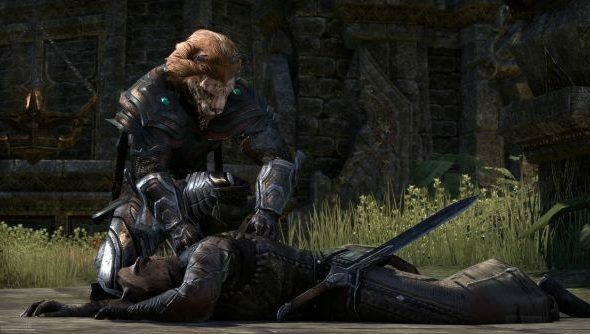 Zenimax have come out of hiding regarding their new justice system, which is heading to The Elder Scrolls Online in the near future. Players will finally be able to don more infamous vocations, such as stealing from and/or murdering NPCs. But these Outlaws won’t have it easy. Players will also be given the chance to police these devious players as Enforcers, where they’re tasked with trying to prevent and catch criminals in the act. Speaking about the new system in a mammoth long Guild Summit panel discussion, Zenimax detailed each role in the Justice System and their benefits. Outlaws are players who steal, pickpocket and murder NPCs for loot. They’ll be able to go into towns of their same faction and commit these crimes for their own benefit. Once they’ve got the loot, they’ll need to dash over to the nearest Outlaw’s Refuge to sell the stuff, but more importantly to escape the clutches of the Enforcers. Enforcers are players who shun these crimes and actively police it. If they spot an Outlaw player doing something they shouldn’t be, they can engage the player in open PVP in an effort to retrieve their bounty. It’s a race against the clock to catch the Outlaw before they get to the safety of the refuge. If they’re lucky enough to recover the stolen goods, they then need to similarly seek sanctuary at the Enforcer Tower. This will flip the chase onto the Outlaw as they try to re-recover their stuff. Critical quest NPCs will be unkillable to prevent players from giving innocent folk a headache during their adventures. Stealth is also getting a rework to allow Outlaws to evade detection from players who are on duty as Enforcers. Zenimax were quick to reaffirm that all of this is still in early development, and subject to change. But regardless, it’s a feature that has my attention after my disappointing experience with the game in my Elder Scrolls Online review.